Back in the day a Bachmann Crab was purchased at an exhibition - possibly in Leatherhead! The Crab had just launched by Bachmann, and it looked very nice indeed sitting in its box on the retailer's stand. And I bought one. This is easily more that 10 years ago, and some of the background to what happened next is a bit murky. I can remember thinking that the flanges were deeper than other Bachmann offerings, and possibly the loco experienced some sort of mechanical failing. As it was brand new, it was assumed that Bachmann would honour the guarantee. They didn't. I should have, apparently, had the Guarantee slip stamped by the retailer, and, at that particular juncture, I could not recall who I had bought it from. This is where paying cash is not such a good idea. That meant that I would have to undertake the repair myself. I had as set of suitable Romford driving wheels to hand, along with the classic 1/8th axle. I think this particular 'standard' was based on the Hornby Dublo axle hole. The Triang chasses always needed bushes. Suffice to say, having fitted the new wheels and axles, although the motor would turn the wheels, it ran like the proverbial 'bag of spanners'. At the time I had projects I wanted to work on, and the Crab was retired. About three years ago I had an early DCC throttle which although the manual contained instructions on how to set-up consists, it wouldn't work for me. I then had a Blinding Flash of the Obvious and dug out the old Crab thinking it would make an ideal 'dumb' loco that could be hauled by the pilot loco. In this particular case a 9F which was more than capable of pulling both the train and a free wheeling loco, as the shot below shows. The motor was removed, and the pair worked rather well. However, the limitations of the original throttle was soon realized, and a NEC Powercab purchased. At which point I could set-up proper 'consists' and the need for an unpowered loco ceased. This saw poor old 42708 relegated back to the stock draw. Eventually the stock draw emptied out as more and more of the old locos were fitted with decoders and returned to the layout. Until just three were left - oddly, all Bachmann. 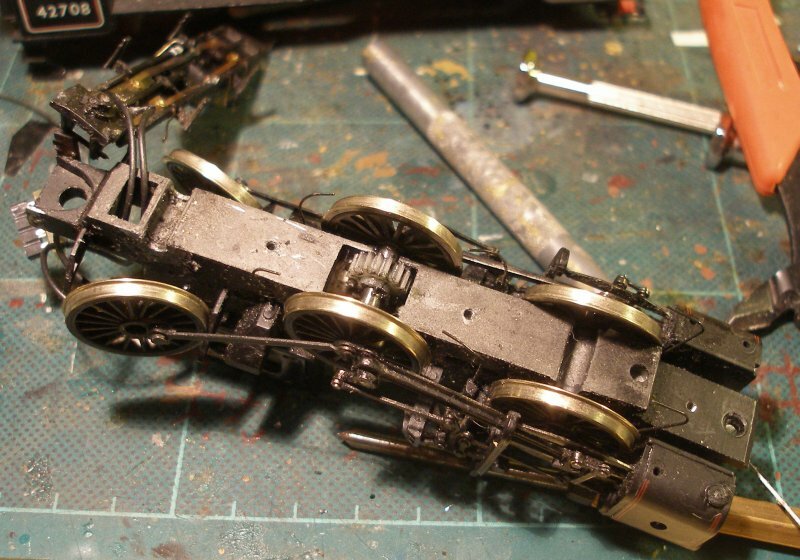 The B1 and Ivatt Class 2 tank are of the split frame type and although lovely looking models, suffer from 'cracked centre plastic stub axle syndrome'. And that left the Crab. A quick Google found that the Walton-on-the-Hill shed gang had also attempted a similar conversion in 2014. The picture below shows the Crab as pulled out of the draw, and with the motor re-installed. Although it looks complete and ready-to-run, I used the Romford 1/8th inch axles, and there did seem to be some slop in the axle holes, although it didn't seem there was enough to stop it running. For a variety of excellent reasons Markits no-longer take faxed orders (despite what it says on the Website, and for no extra charge Mark Arscott will sing 'Polly put the kettle on' to your fax machine). Banks have closed, bank charges have risen and Mark doesn't do PayPal. So we agreed that I would do that thing you are not supposed to do and popped a £5 note sleeved within the order form and popped into an envelope with a First Class stamp on it. Suffice to say neither Mark nor I have subsequently seen the envelope, and there seemed little point in repeating the exercise. So where do you get your Romford bits and pieces from if Markits cannot take payment, and Mainly Trains have closed? A scan around the Web, and a chat with Scalelink provided the following list: Scalelink; Branchlines: Roxey; 247 Developments, and 3mm Scale Models. 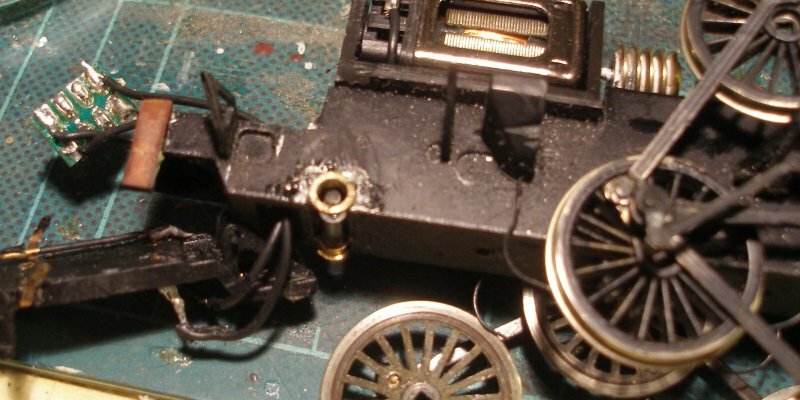 Scalelink did not have the 3mm axles in stock; Branchlines do not have a Website; Roxey appeared to have just the regular 1/8th" type, but Malcom at 3mm Scale Models had them with the knurled axle (to grip the gear wheel), so three were ordered with the intention of turning off the knurling on two of the axles. When ordering from here do state that you are OO, as funnily enough Malcom tends to stock TT (3mm scale) materials.